The NJ H-Net discussion group is the best place to keep in touch with what is happening in the NJ History Community. You can check out the messages at http://www.hnet.org/~njersey/ or subscribe. I am happy to be able to refer people to the new history calendar. They did a great set up and people can add their own activities. I am hoping people will really keep it updated. So many things going on in the state. Almost every day you can find something interesting to do. I got to help judge some of the 4th grade essays for www.celebratenj.org .I really enjoyed the writing, I hope to put some of them online soon. Waiting for parental permissions!! A great site to check out: RancocasNJ.org ! The unofficial site of the historic Village of Rancocas, New Jersey in Burlington County. They have a wonderful picture gallery and an interesting letter by Elias Hix. Let me know what you have been doing? 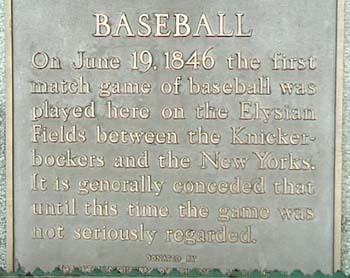 It's almost baseball season, while your waiting to hit the field check out some Baseball History. You are the 38748th Visitor to this Site, since the March 24, 2007. Site Highlights: About this site, how to use it, with a note for students. USGenNet is a nonprofit historical and genealogical Server that is currently run by volunteers with a shoestring budget. I appreciate the web space they provide, so that I can provide information without cost to me or to you, and no advertising! Donations are always appreciated. Success is expensive, requiring more servers and increased band width. If you have any funding or grant ideas, email me and I will pass it along.